Written by José R. Sánchez-Fung. China’s policymakers are committed to rebalancing the country’s economy after a long boom in output growth resulting from widespread reforms executed since 1978. Figure 1 shows gross capital formation and the current account balance during the three-decade period ranging from 1982 to 2016. 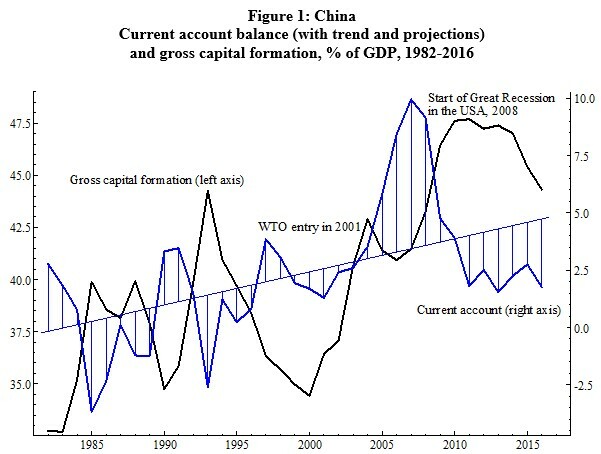 The data shows the upsurge in the current account balance in relation to the long-term trend following China’s accession to the World Trade Organization (WTO) in 2001, peaking at around 10% of GDP in 2007, just at the onset of the Great Recession in the U.S.A. The figure also shows gross capital formation increasing from about 34% of GDP in 2000 to almost 48% in 2011. The time series in the graph provides a snapshot of the well-known story of how China’s successful economic growth led to macroeconomic imbalances and to a subsequent shift toward fostering domestic investment. But that rebalancing in turn contributed to ongoing concerns about the relatively high leverage in China’s private and public corporate sectors. The leveraging developed together with the expanding financial system, including the rise of a shadow banking system. For that reason, China’s authorities’ efforts to rebalance the economy include promoting investment overseas. However, pursuing that objective somehow conflicts with the People’s Bank of China’s closely managed exchange-rate policy. Financial outflows could weaken the renminbi, subsequently reducing the relative value of China’s exports, and potentially worsen the situation by boosting net exports. So a tightly managed monetary policy is necessary, though not sufficient, to maintain macroeconomic stability given the exchange rate’s central role. This predicament can limit the range of options for the country’s outward investment policy as a tool for diversifying and ultimately dealing with the macroeconomic imbalances. In the context expounded above, China’s investment overseas is growing. In the developing world, Africa is an example of a region in which China has significant investment projects, even though the presence is not as large as that of other foreign investors. Moreover, China is amongst Africa’s most important trading partners. Much has been written about the Africa-China relationship and the story is ongoing. More recently, China’s diversification overseas is reaching Latin America. The volume of resources is potentially significant for a region long marred by a deficient amount of infrastructure investment. The Inter-American Dialogue reports data shows that from 2005 to 2016 China’s lending to the region totalled over $140 billion. From that amount $100 billion went to energy and $24 billion to infrastructure. The main lenders are the China Development Bank and China’s Export-Import Bank, with the former accounting for the largest share of the volume with over $100 billion. Which countries are receiving the largest share of China’s funding in Latin America since the mid-2000s? Brazil is one of the top recipients, but Venezuela comes first in the list mainly due to natural resources. Ecuador enters third and is closely followed by Argentina. According to data from the China-Latin America Finance Database, during 2005-2016 China completed 17 loans to Venezuela. The sectors securing the loans were energy, infrastructure, and mining. Brazil, the second largest destination of funding, agreed 10 loans and the projects were mainly in the energy sector. Ecuador negotiated 3 loans and Argentina a total of 8. Ecuador’s loans were agreed for the energy sector, while Argentina attracted backing for infrastructure and energy projects. David Dollar argues that the volume going to each country tallies with what is expected: on average, larger economies are attracting more investment. Turning the focus to overall foreign direct investment (FDI) numbers, in 2016 Latin American countries attracted about one-fifth of the total reaching developing countries. Parallel to that, and according to data compiled by the United Nations Conference on Trade and Development (UNCTAD), during the last decade, there is no marked trend in the volume of China’s FDI to Latin America as a share of the total for developing countries. The share actually peaks in 2005 with almost 60% of China’s FDI to developing countries in that year benefiting Latin America. Following that highpoint, the number decreases and in 2012 recorded just under 10% of China’s FDI. 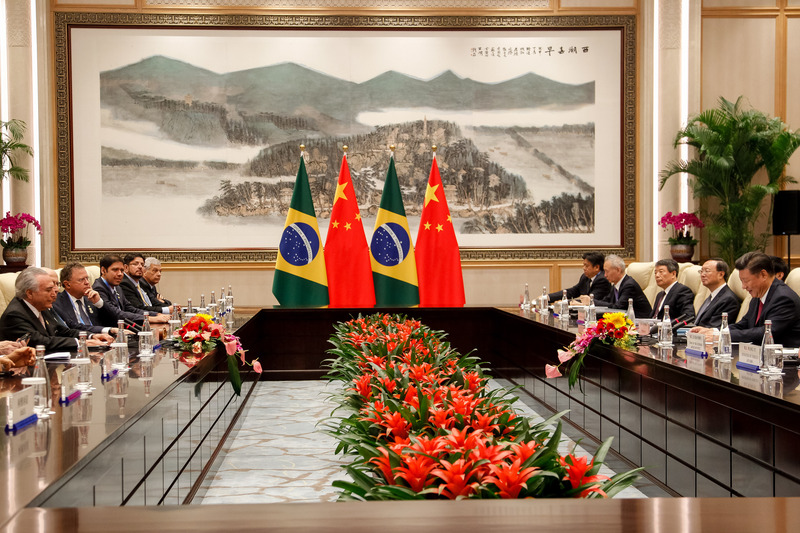 Therefore, China’s FDI to Latin America to some extent resembles the actual financial lending reported by the Inter-American Dialogue for the period ranging from 2005 to 2016. However, reconciling the FDI and lending figures going from China to Latin America is beyond the scope of this article. China is trying to rebalance its economy following a period of rapid output growth contributing to substantial macroeconomic imbalances. The strategy to address the imbalances comprises increasing outward investment and, in that context, Latin America is becoming more significant in the country’s international investment portfolio. What happens in the future is expected to depend on economic fundamentals including market size, investment climate, and China’s options elsewhere in the world. 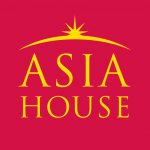 José R. Sánchez-Fung is Assistant Professor in Economics at Nottingham University Business School China, the University of Nottingham Ningbo China. Image credit: CC by Michel Temer/Flickr. Can the summit in Wuhan reset India-China ties?